As you may know by now, Eugene O’Brien has decided to depart from The Sons of Navarone. Your last chance to see him shine with them will be on Friday, February 5th at the Toogenblik in Haren (Brussels), at 08:30pm. Since the number of seats is limited, this concert will be on reservation only. 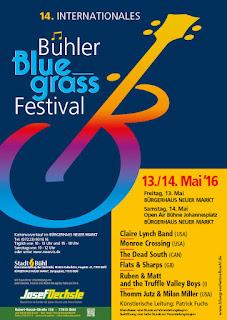 If you are interested, please send an e-mail to info@bluegrass.be for your reservation. Tickets are only 10€ if reserved before January 15th, 13€ if reserved after. Zoals je misschien hebt vernomen, heeft Eugene O’Brien besloten The Sons of Navarone te verlaten. Tickets zijn slechts 10€ bij reservatie voor 15 januari, daarna 13€. Vous l’aviez peut-être déjà appris, Eugene O’Brien a décidé de quitter The Sons of Navarone. L’entrée est de seulement 10€ pour les réservations avant le 15 janvier, 13€ après. 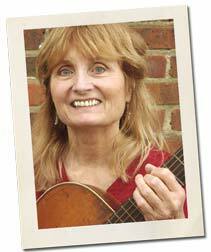 The second annual Hazel Dickens Song Contest is now open for entries. 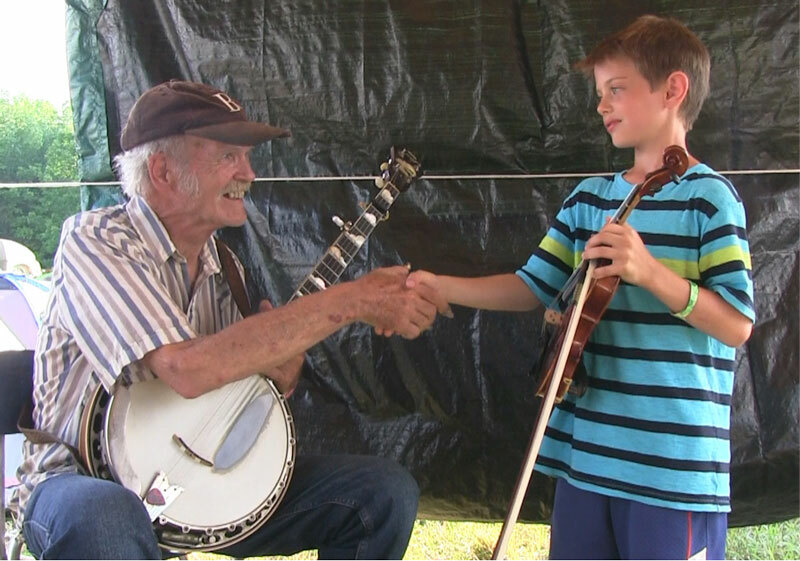 The contest pays tribute to one of bluegrass music's most beloved songwriters. From hardscrabble beginnings in West Virginia coal country in 1935, Dickens moved to Baltimore, MD, as a young woman to find factory work and quickly connected with local musicians. She started performing throughout the Baltimore/Washington region and was soon recognized for her singular mountain singing style and her gift with a lyric. Hazel wrote of coal miners, unionization, hard times, feminism and much more. She died in 2011. 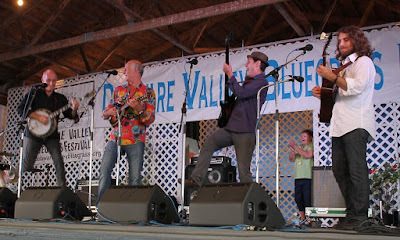 The contest category is bluegrass, including gospel. Entry fee is $30 per song and all entries must be received by January 15, 2016. First, second and third-place winners receive cash prizes and will be announced on March 10, 2015. Entry rules, judging and prize information can be found at www.hazeldickenscontest.org. All proceeds from the Hazel Dickens Song Contest help fund the DC Bluegrass Union. 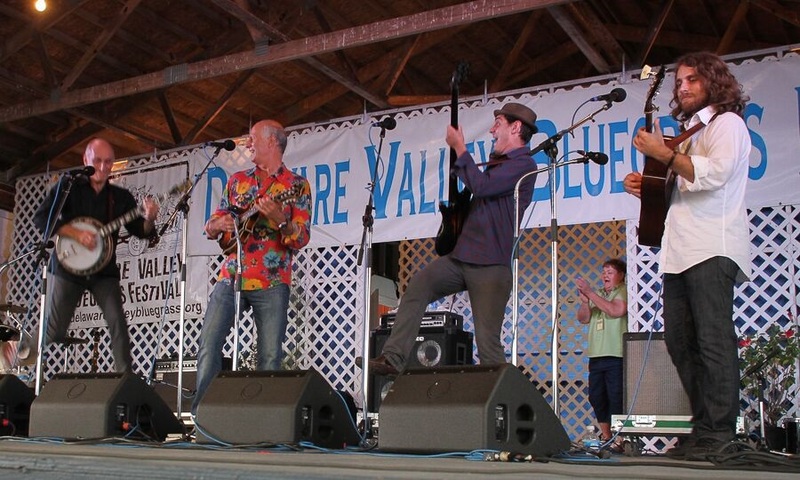 DCBU is a 501(c)3 nonprofit membership organization with a mission to promote bluegrass music in the greater Washington region through education and performance. 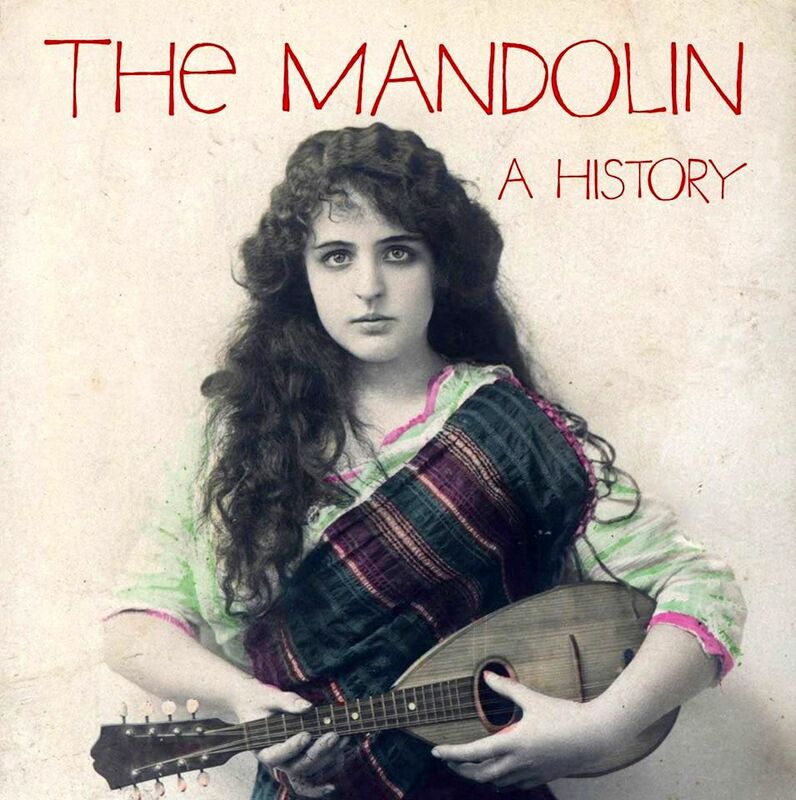 The Hazel Dickens Song Contest is open to those whose primary source of income (50 percent or more) is not derived from songwriting or publishing. Income from performing gigs is not songwriting income. All entries must be the original work of contestant and shall not infringe on any copyright or any other rights of any third party. Contestant may enter as many songs as desired. Each song submitted must have both instrumentation and lyrics. Lyrics should also be written and recorded in English. Categories: Bluegrass (includes gospel). No instrumentals, please. For more information, contact Randy Barrett via email or at +1 703-405-6230. You may have seen or heard about the announcement regarding this amazing music history project in August? Well, word came down to us last night that the first shipment of the book is on its way to author and publisher, Graham McDonald. It is now available for purchase at his website. The next issue of "Bluegrass Europe" magazine will include an in-depth article and review of the new book, including photos. The new issue needed some corrections, therefor is a bit late in printing. It should be arriving in your mail soon. Retail Price: $45 (USD) Postage is free in USA only. It has been an autumn of pleasant music surprises so far including two involving King Crimson! King Crimson? I hear you say. 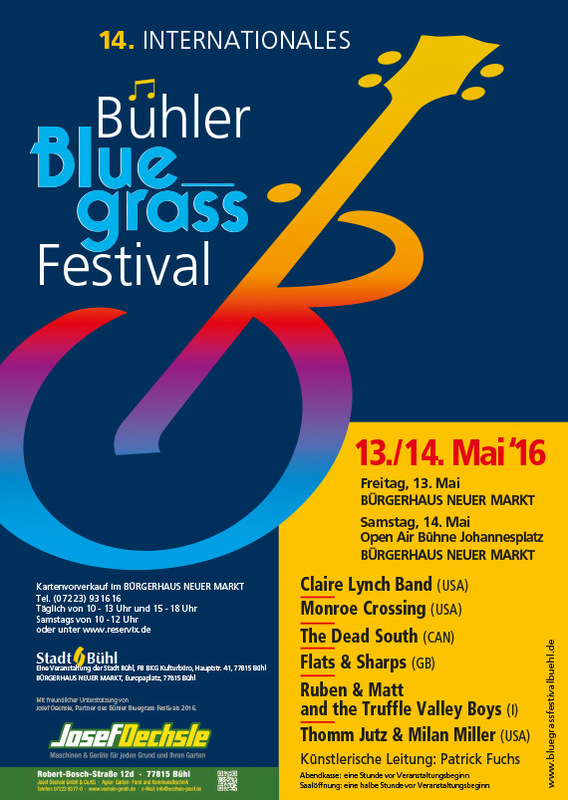 Yes - I know this is the European BLUEGRASS Music Association Blog but I shall explain more later. 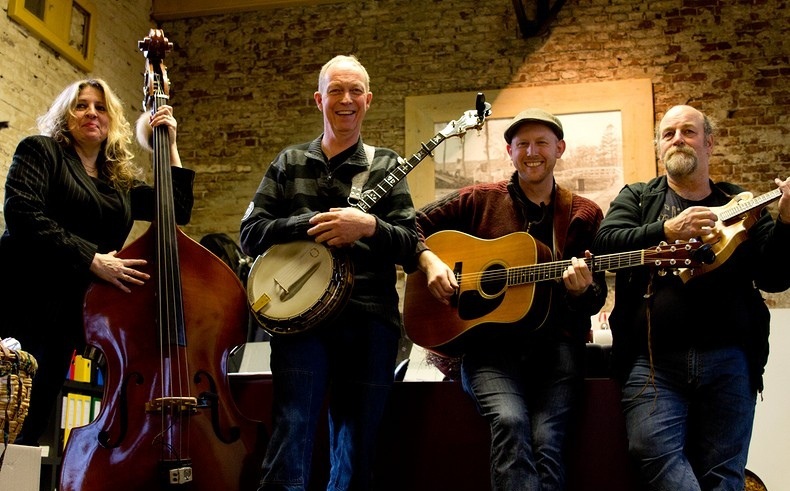 On Sunday evening (22nd November) we ventured out into The Fens to see Front Country at the South Holland Centre in Spalding for the last concert of their UK tour. Just a word about the South Holland Centre: this is a wonderful venue - large enough to accomodate a good-sized crowd but small enough to feel that you are at an intimate concert. We shall be returning in April for The Railsplitters* but intend to return sooner than that! But what about the concert? As previously reported in the EBMA blog article in August, Front Country had been in the UK since early November and we had been hungrily reading the reports and watching YouTube clips from the tour; particularly as we had missed seeing Front Country play at MerleFest in North Carolina - don't ask, a long and dismal tale - so having the opportunity to see them play in the UK was exciting. 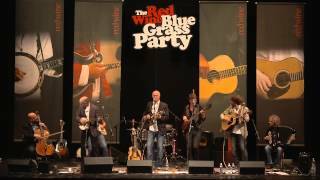 One of the clips from the tour which was viewed prior to Sunday (and heard played live on Sunday) was 'You Can't Blame The 80's' by Adam Roszkiewicz (mandolin) and Leif Karlstrom (fiddle) who also perform as the duo 'Small Town Therapy'. 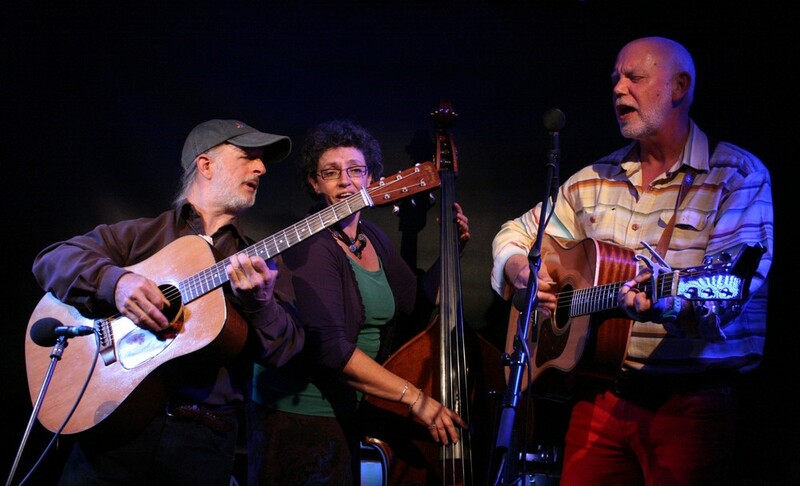 In addition to this, the concert naturally drew from Front Country's most recent recording 'Sake of the Sound' but also included material from Melody Walker's 'Gold Rush Goddess' including the un-plugged finale of 'Family Band'. Despite having previously played 15 dates with just two days rest, the band were fresh as they took the stage and immediately had the audience in the palms of their hands. The power and versatility of Melody Walker's voice is exceptional as witnessed from her singing of 'One Kind Word' and 'Colorado' to the powerful rendition of 'Gospel Train' which closed the first half of the concert. (Please note that I did not say 'Larry Sparks' 'Gospel Train'' because Front Country have made that song their own, in my opinion). 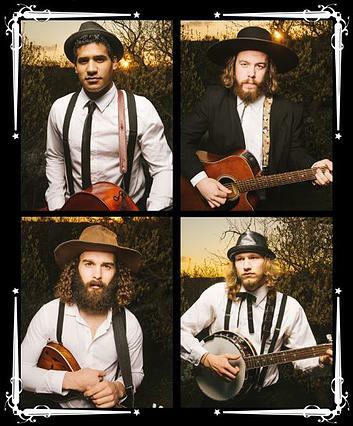 But there is more to Front Country than the spine-tingling vocals of Melody Walker; Adam Roszkiewicz (mandolin & banjo) & Leif Karlstrom (fiddle) have already been mentioned and along with Jacob Groopman (guitar & banjo) and Jeremy Darrow (bass), this is a band of fine musicians. During the second half of the concert, we were told that the band are working on their follow-up to 'Sake of the Sound' but would also be releasing an EP of cover versions in the near future. At this point I smugly thought I knew what would be coming next. 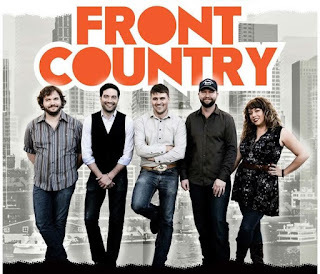 Prior to their appearance at MerleFest, Front Country had released a video of them singing Don Henley's 'Boys of Summer' and, more recently, close to Halloween, had released a video of them singing Talking Heads' 'Psycho Killer'..it will be one of those, I confidently told myself. I was looking forward to seeing the looks on the faces of the audience as either song began only to find that the look of astonishment was on my face as they broke into King Crimson's 'Three of a Perfect Pair'** and - as our Transatlantic cousins would say - killed it! But here is their version of 'Boys of Summer'. It is rumoured that Front Country will be returning to the UK next Autumn and I hope that this is the case. If you saw them, then I am sure that you will look forward to seeing them again and if you missed them this time, make sure you catch them on their next visit. You can be kept advised of Front Country news by signing up to their mailing list on their website. I know from speaking to Melody after Sunday's concert that many of those attending the UK concerts had added their names to the mailing list, but I would strongly recommend adding yourself to the mailing list on-line as quickly as possible to make sure that you don't miss a thing and be granted immediate access to some exclusive tracks by the band. Note: I found that the signing up system did not recognise UK postcodes but this could be overcome. *More information, along with UK Spring Tour dates for The Railsplitters can be found on the Brookfield-Knights website. **I mentioned two King Crimson-related surprises this Autumn, the other was being invited to King Crimson's pre-tour concert but a friend who had recorded with Robert Fripp in the 60's. 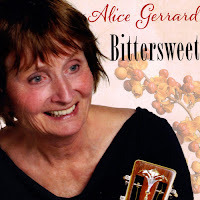 Alice Gerrard, legend of old-time country and bluegrass music, is announcing one of La Fuente most exciting weeks ever. 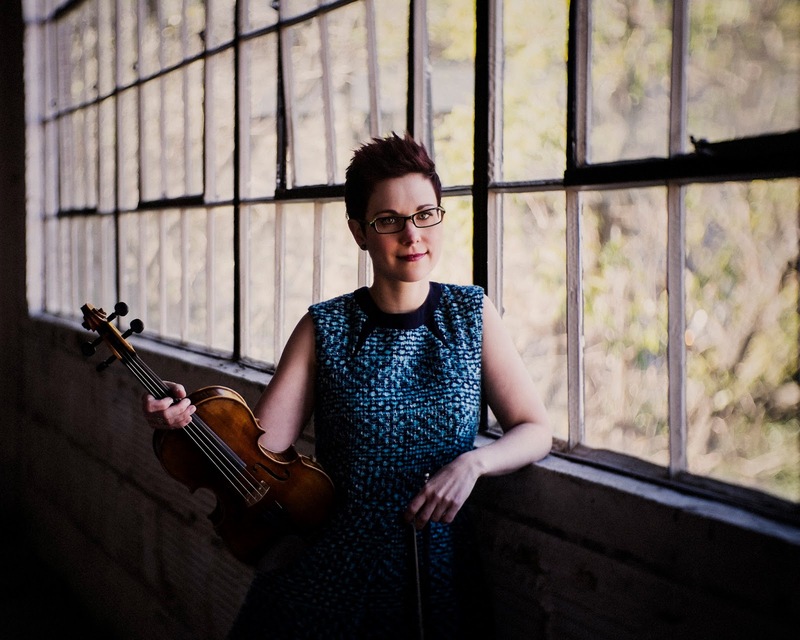 She will lead participants in music and song through classes that will include singing, fiddle, banjo, guitar (all at various levels) plus beginner's instrumental, Wernick method jamming, percussive step-dance and song-writing. 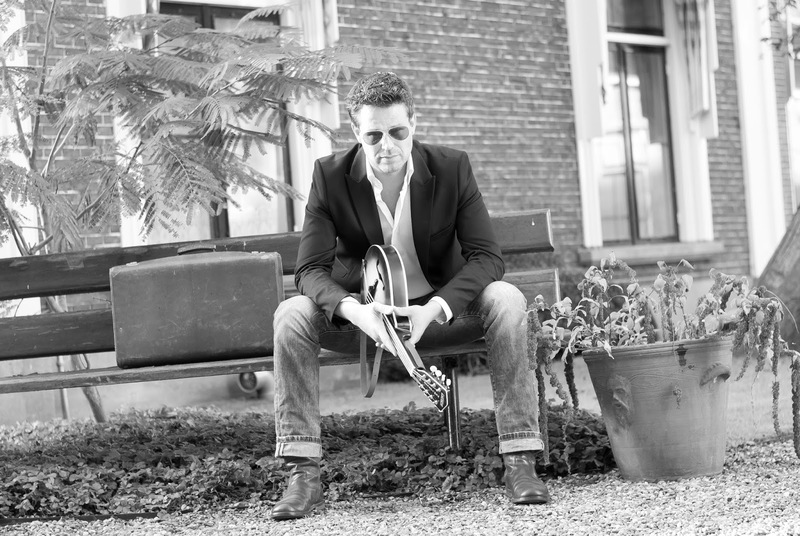 This time, Alice will be joined by one of her long-time musical partners, Tom Sawber, a luminary of the old-time country scene in the US, due to his brilliance as instrumentalist and singer. Both teachers are at the pinnacle of their field, and carry a wealth of knowledge and teaching skill. They can not be recommended highly enough, and it would be a pity to miss this rare opportunity to spend an intimate week in their excellent company. 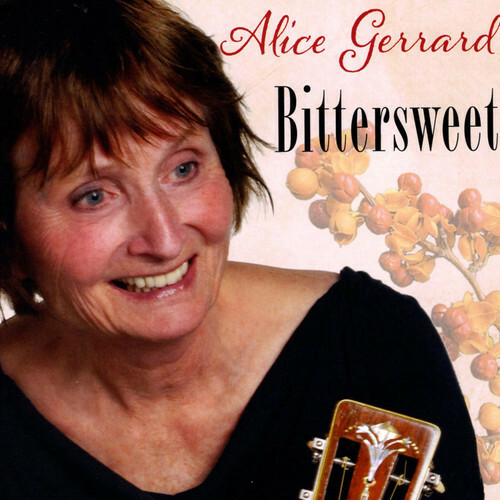 A new highlight of the week will be a songwriting group, facilitated by master songwriters Alice Gerrard — who was nominated for a Grammy for her recent work, Bittersweet — and Sooz Clare. 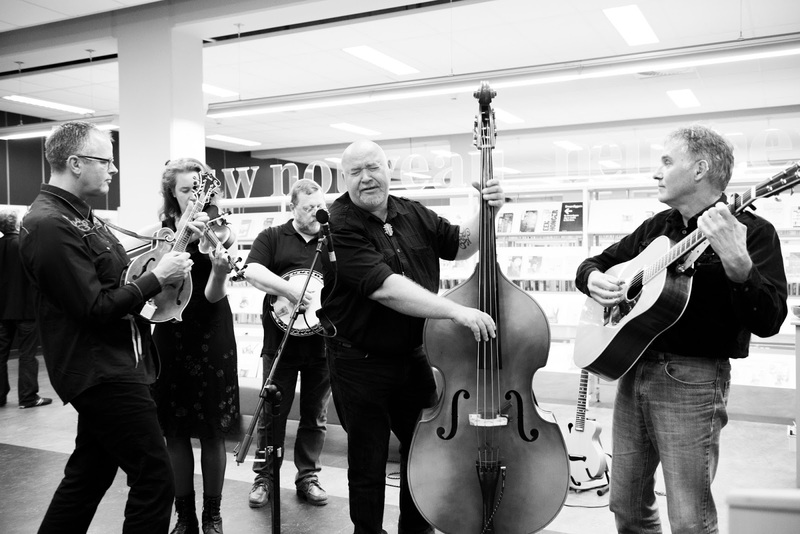 Joff Lowson will offer his Wernick Bluegrass jamming workshop and a beginners’ instrumental class, for any stringed instrument. This will be suitable even for those who have never touched a musical instrument before. A percussive step-dance, voice and banjo, all from Buffalo Gals’ own John Whelan, Sibs Riesen and Kate Lissauer, will also be offered. 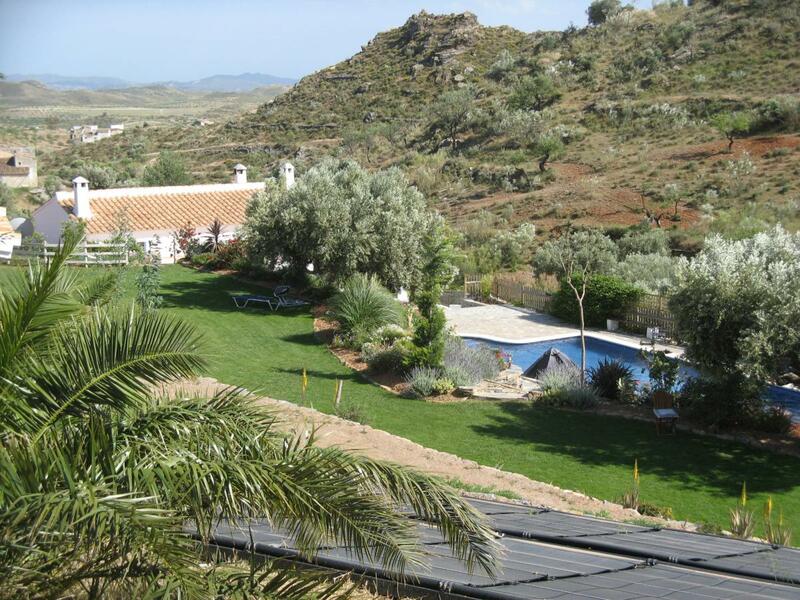 The classes will be held in a beautiful and remote valley located in mountainous south-eastern Spain, an hour’s drive north of Almeria. The site is a self-contained oasis, very private, nestled in a bowl of hills. Residents, teachers, and staff live together in two beautifully restored old farm houses — casitas — and a charming sleeping house, all surrounded by exquisitely landscaped terraces. You can find direct details of all inclusive not-for-profit week, costs, travel, early booking discount and venue, at La Fuente Holidays website. Close your eyes for a few seconds and think of towns that you would associate with Bluegrass and banjos. So, who was on your list? 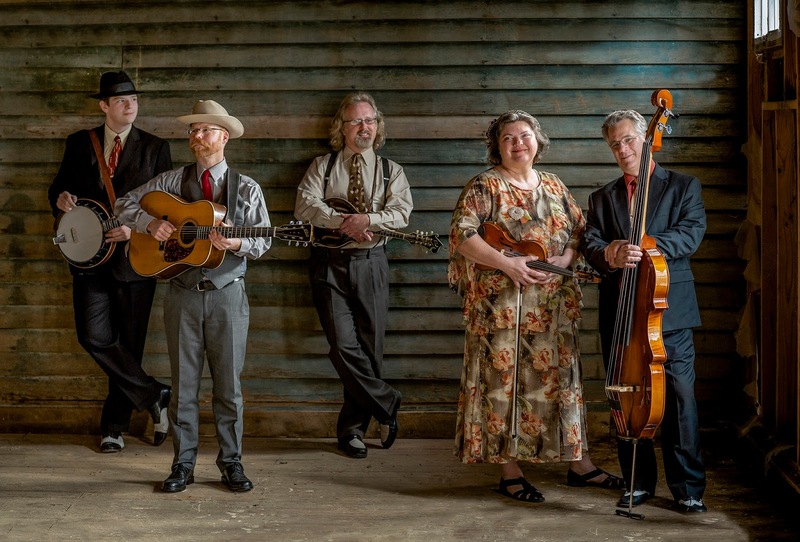 Was it Galax, the home of the annual Fiddlers Convention in Virginia, or Union Grove which has held the Ole Time Fiddlers & Bluegrass Festival for over 75 years – or how about Rosine in Kentucky, the resting place of Bill Monroe? What about Huddersfield in West Yorkshire? If not, maybe it should. Huddersfield is where you will find Eagle Music who are Deering Banjos’ No. 1 dealership world-wide. 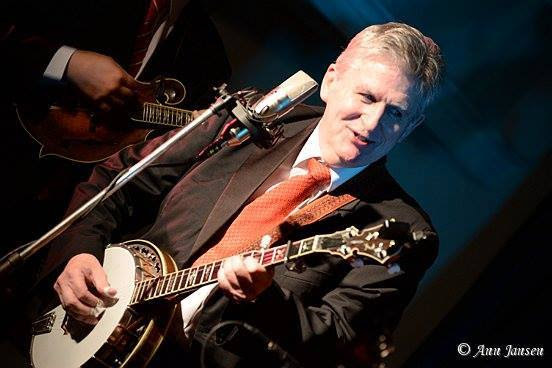 Following their presentation with a Distinguished Achievement Award at IBMA in 2014, 2015 is another significant year for Deering Banjos as they celebrate their 40th Anniversary of making banjos. 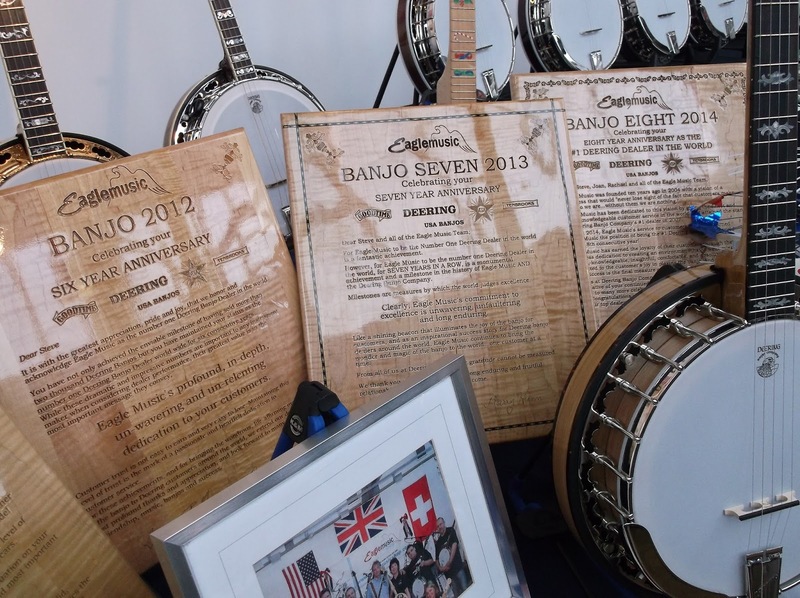 2015 has also been a significant year for Eagle Music who are, once again, the No.1 reseller of Deering Banjos worldwide - their 9th consecutive year as No.1. We might read about and see advertisements for some of the renowned instrument shops in the U.S. but we have one of our own here in the U.K. - Eagle Music. The Deering Banjos 40th Anniversary Event had a full programme of on-stage performances and workshops such as those by Pat Kelleher (Long Neck Banjo) and Bill Forster (Bluegrass Banjo) as well as the opportunity to try many of the Deering banjos on display and other instruments available at Eagle Music. As described by our friends at the Bluegrass Ireland Blog, Ireland was well represented and, perhaps, most prominently by JigJam who performed two sets - the second being the opener for the evening concert with The Kruger Brothers. 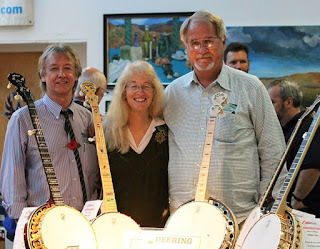 During the morning there was an on-stage presentation by Janet, Greg and Jamie Deering about the beginnings and evolution of the Deering Banjo company. We were told about the creative approaches to marketing and advertising that Greg and Janet took in the early days and how the aircraft industry in their region gave Deering Banjos the opportunity to obtain materials with which to produce their own manufacturing hardware. While Deering Banjos have associations with artists such as Scott Avett, David Holt and Tony Trischka - and, of course, Jens Kruger - it was interesting to hear about how important it was to the Deerings to develop the Goodtime range so that those seeking an entry-level instrument could benefit from the manufacturing quality that the professionals had come to rely upon. The innovative attitude continues at Deering Banjos with new materials and methods being researched and, with over 250 years of banjo-making experience within the Deering staff team, it is clear that Deering Banjos are not resting upon their laurels. But what about the music? Well...there was the (now) traditional massed banjo extravaganza with a rendition of Oh! Susanna which started with a gentle tempo to enable the fingers to warm up followed by an interesting change by Uwe (I think it was to see if everyone was paying attention!) and then the full-speed version. 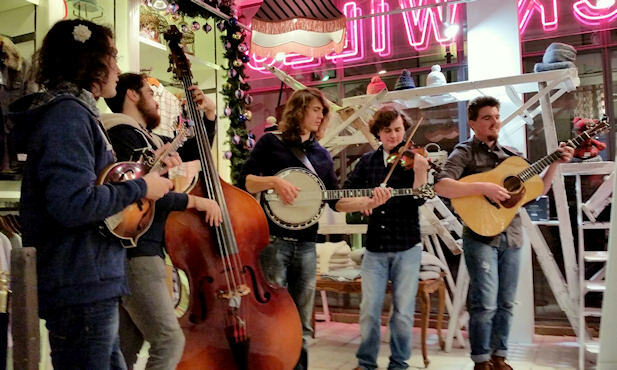 JigJam, from Ireland, have recently returned from a successful tour of festivals in the U.S. and are scheduled to return their again in 2016. 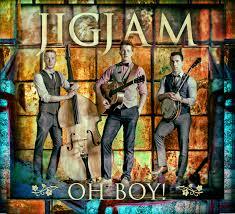 Having previously reviewed their CD, Oh Boy!, in the EBMA Blog, it was good to meet them and hear them play live. From their sets it is easy to see why the organisers of Bluegrass and Irish Music festivals are keen to have JigJam appear. They have a warm stage presence combined with great musicianship with each of the members - Jamie McKeogh, Daithi Melia and Cathal Guinan moving comfortably between instruments and sharing vocals . The day concluded with a performance by The Kruger Brothers which included pieces from their latest recording 'Lucid Dreamer'. 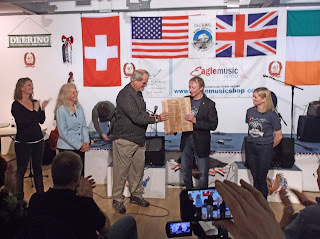 As might be expected, the performance was exceptional - many of the audience had been at the North Light Gallery all day and had seen Jens, Uwe and Joel on stage and spending time talking with, helping and advising people who had come along for the Deering Banjos 40th Anniversary Event. The rapport between The Kruger Brothers and their audience can never be overstated and if you have seen the film 'Beautiful Nothing' made by Dames Don't Care about The Kruger Brothers you will know that this opinion is universal amongst their fans. The set included their song 'Carolina In The Fall' for which there is a movement to have this song adopted as the state song for North Carolina and which is the name of the Kruger's home-town festival which will be taking place in Wilkesboro, North Carolina on September 23rd & 24th 2016. Hopefully, we shall see The Kruger Brothers on this side of the Atlantic before then. 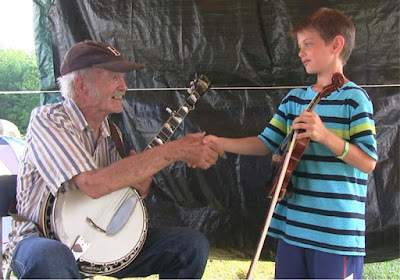 A genuine piece of Bluegrass history. The late Mike Auldridge's primary (and favorite) resophonic guitar played exclusively on recordings and in performance from 1983 through 1993; his 1935 Regal/Dobro #426. 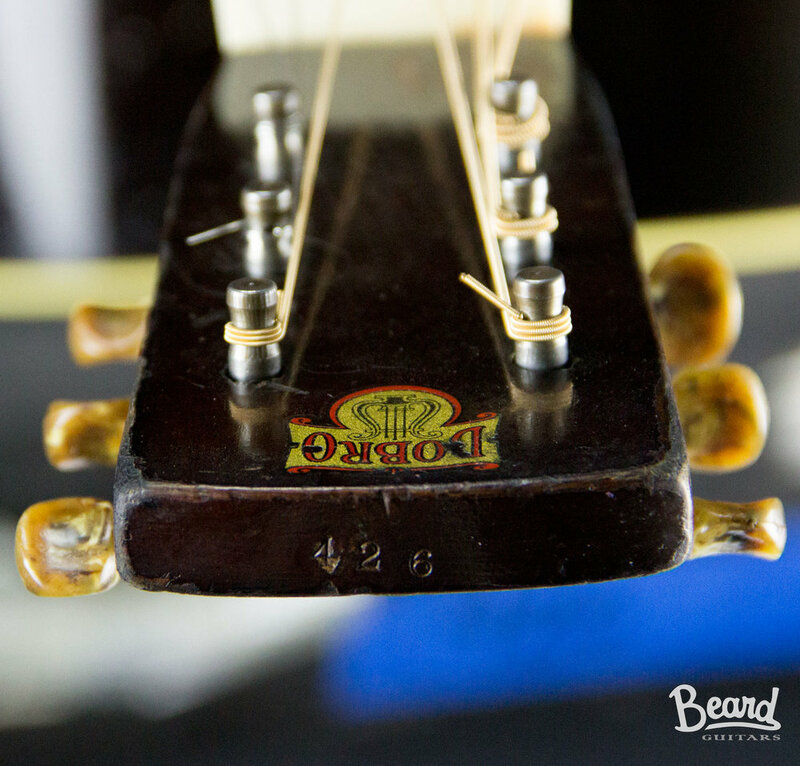 This guitar is the last of Mike's personal guitars that will be made available to the public. It is being sold to benefit his family. 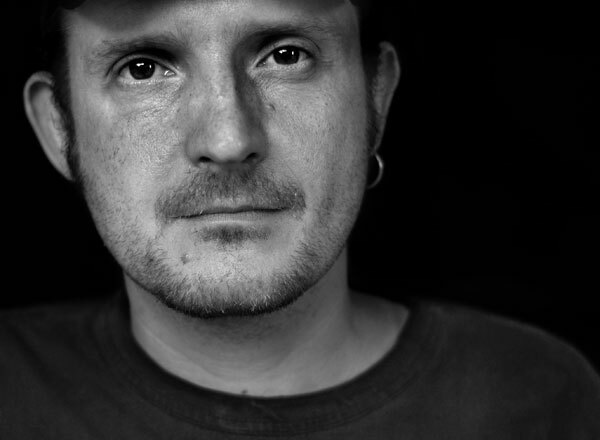 Fellow bandmate and friend, John Duffey, used to jokingly introduce Mike as "The Legend". It was no joke. 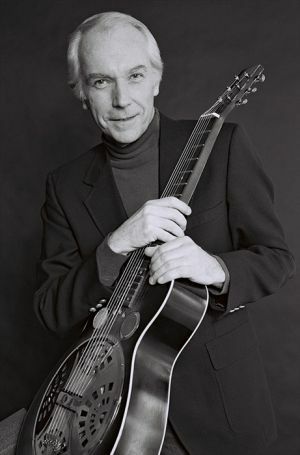 Duffey admired and respected Mike Auldridge perhaps more than anyone else in his musical life. So did Mike's many fans. 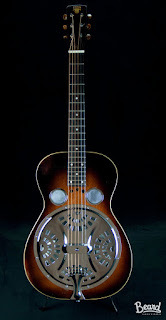 He was one of the very few true innovators in the history of the resophonic slide guitar world. Those familiar with his music with the band 'Seldom Scene' or solo recordings know he had a very special touch on the instrument. This instrument was Mike's "baby". Mike passed away 29 December 2012. While sad to see iconic tools-of-the-trade have to leave their Master, it is often out of necessity to offer them for sale. In a best case scenario, we might hope someone with the talent to do so will be the new caretaker. Someone who will honor and continue the history of this beautiful well-played piece. 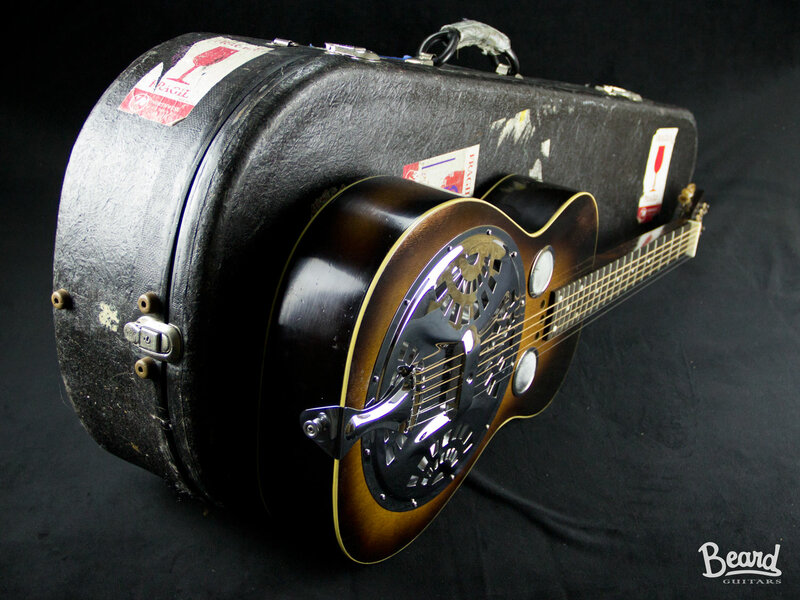 Regal/Dobro #426 comes with Mike Auldridge's custom-built case, a letter written and signed by Mike telling the story of this instrument, and several other items. More details and price may be found at Resophonic Outfitters. We are pleased to announce the first EBMA Youth Scholarships for 2016. They go to 15 years old Evan Lyons from Ireland and Tabitha Agnew, 17 years old, from the United Kingdom. Both submitted applications and samples of their music which were assessed by the EBMA Board who then made the awards. Evan and Tabitha have both requested to go to the Sore Fingers Summer School which will be held during the week of Easter 2016 at Kingham Hill School, which is near Oxford in the UK. 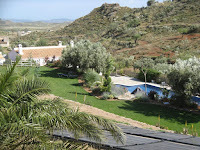 Sore Fingers is a very well established teaching camp which has been running for twenty years. It accommodates over three hundred students for six days of intensive tuition with teachers from the USA for Bluegrass and Old Time Music. 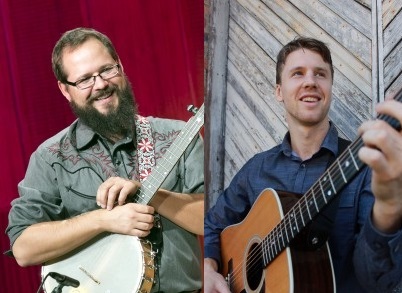 Tabitha will study banjo with Ron Block, best known as the banjo player in Alison Krauss and Union Station, while Evan will study with Greg Cahill the leader of the band Special Consensus. So two great musicians to pass on their knowledge to these two young musicians. EBMA is delighted to have been able to award scholarships to these young and talented musicians. 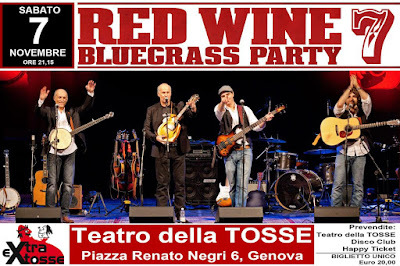 The Red Wine Bluegrass Party No. 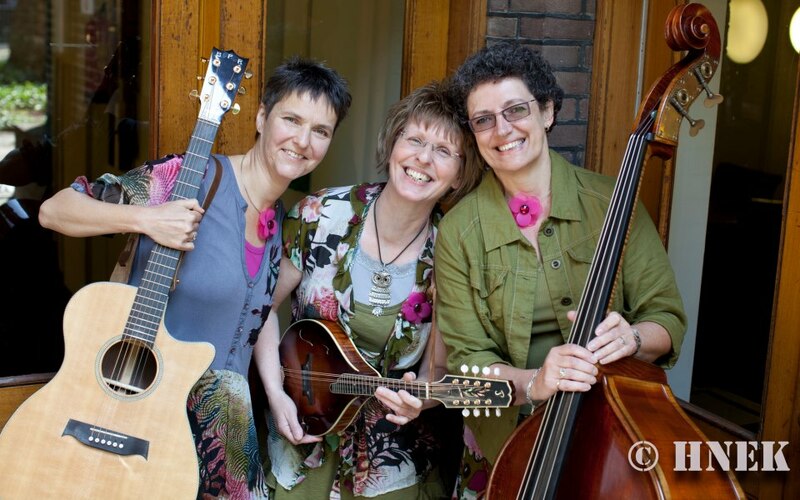 7 - "A Bluegrass Journey" – will be an imaginary journey into bluegrass music. It will start from its Anglo / Scots / Irish origins, mowing at first towards old time music of the early American colonies, and then to country music. 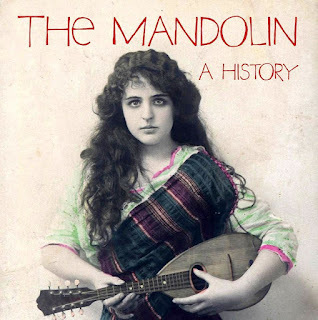 It will follow the Southeastern US early blues / gospel tradition and Bill Monroe, the charismatic mandolin player and leader of The Bluegrass Boys, thus eventually leading to Bluegrass music. 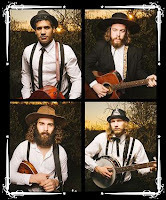 The journey will continue exploring other subgenres, born from the latest contamination with folk, jazz, pop and rock that in many cases allowed Bluegrass to establish itself in countries far from its origins. A number of national and international guests will accompany The Red Wine on this trip (Filippo Gambetta organet, Henrich Novak dobro, Jiry Kralik violin, Michel Balatti flute and other surprise guests), adding different sounds and atmospheres to the show. Enjoy some of their music while waiting for the show! For further info: the Red Wine website or Facebook page. ...and thanks for so many awesome all-night jam sessions throughout our decades together. After a successful 5-year run at Het Kasteel in Groningen, Netherlands co-producer / host of the "Castle Picking Party" Hans Kelderhuis announced a new location for the annual all-day jam and concert event. 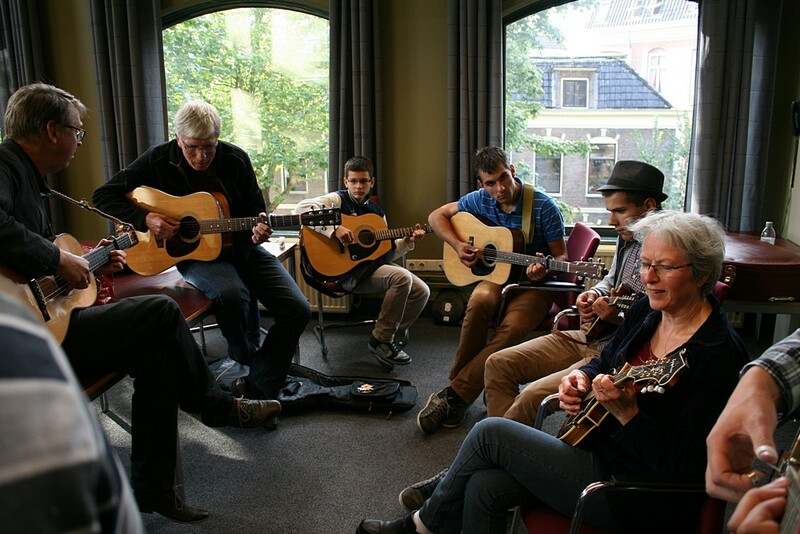 Prior to the last set in the castle's concert hall on September 27th it was revealed that the free public Picking Party will be held in Borger, NL (province Drenthe) beginning in 2016. 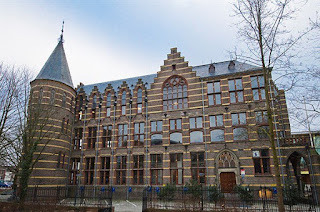 "Cultuurpodium VANSLAG" will be the new home for the annual gathering. VANSLAG is perhaps the most beautiful and accomodating indoor music showcase in all of Holland. 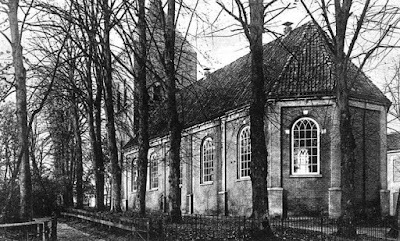 The historic 'old village church' in Borger, having been carefully renovated in recent history, now houses one of the most favorable and inviting music venues in the entire country. Dutch entrepeneur, Master Photographer, and music enthusiast Henk Eggens and his wife are the main force behind this amazing musical experience. From lighting to excellent acoustics to hospitality, this couple and their colleagues operate one of Europe's 'best kept secrets'. The new venue offers many rooms for jamming, and a theater for the mini-concerts throughout the day. 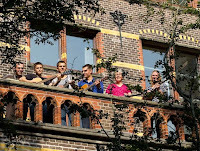 There is also plenty of space outdoors for jamming in nice weather. Mark your calendars and join musicians from several countries next year as they get together for the annual all-day / early evening jams and concerts on September 24, 2016 -- now at Cultuurpodium VANSLAG. The organizers are interested in your suggestions for a title of the event as it moves to its new location in Borger. 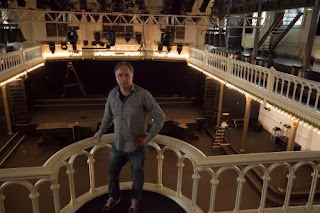 You may email your ideas for a new name to hanskelderhuis@gmail.com. On a rainy Sunday at the end of September the foyer of the Two Rivers Cinema in North Wilkesboro, North Carolina was - as you might expect - busy with a flow of families and couples arriving to buy tickets for a movie and queueing for popcorn. The foyer then filled with rather well-dressed crowd who waited patiently, chatted amongst themselves and were then invited into the cinema where refreshments would be served before the film began. 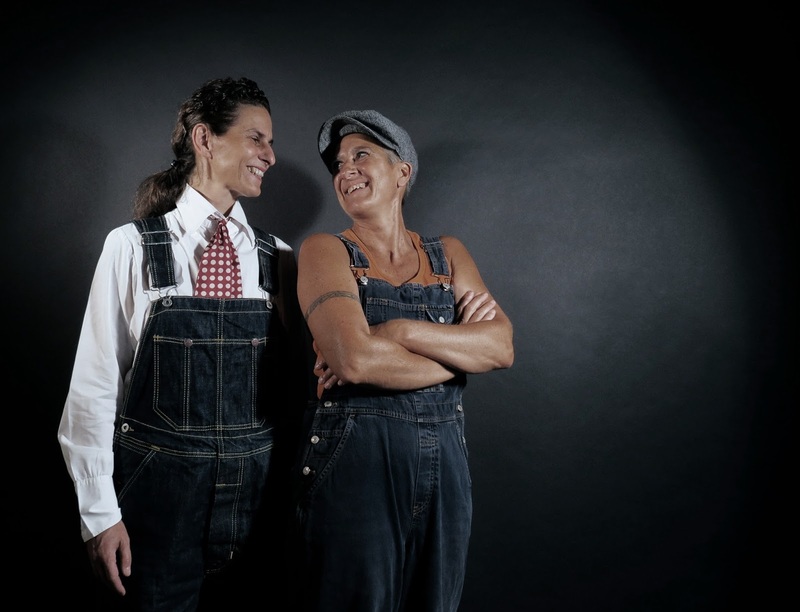 This was the U.S. premiere of 'Beautiful Nothing' a film about the Krüger Brothers which had been made by Gabriele Weber and Brigitte Bernhard; otherwise known as 'Dames Don't Care'. 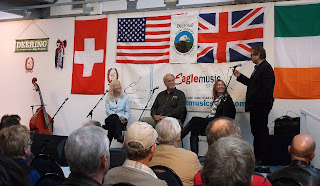 Once seated, the audience were addressed by the Krüger Brothers, the film-makers (Gabriele & Brigitte) and then Elaine Marshall, Secretary of State for North Carolina, who welcomed the audience and spoke warmly of the Krüger Brothers and how they have become a part of North Carolinian cultural life. The film is, in places, very personal yet sensitive and includes conversations with Jens & Uwe Krüger and Joel Landsberg, members of their families as well as their friends and fans. Below is the trailer to the film. What drew you to make a film about the Kruger Brothers? DDC: First of all, we just wanted to make a documentary about music. Our first documentary was about the retro culture in the USA. That was in 2007. And after 4 years we felt like... let‘s do another documentary. We had several ideas, then Brigitte started to play the Banjo and met the Kruger Brothers on a Workshop... and we found our new topic. She was so impressed about the human beings behind the musicians and heard so many stories from her teacher Hansj, who was a former student of Jens. Actually, we [attended] two concerts [by] the Kruger Brothers long before that and we were very impressed. But that was before they moved to the USA and before we started to make documentaries. So we contacted the Kruger Brothers and told them about our idea and they stood right behind us. the limitless possibilities that can be achieved with courage, passion and single-mindedness. Were you Bluegrass fans before starting the film? DDC: [In music] our first love belongs to the era between the 20's and 50's. So we never were Bluegrass fans in particular but music lovers in general. ; and we wouldn‘t say that we are specifically Bluegrass fans now. But when we look at the thousands of vinyl records and CDs that we have in our collection, the number of the recording that we have by the Kruger Brothers is only equalled by those Billy Holiday and Ella Fitzgerald. How long did the film take to complete? DDC: Brigitte met the Krugers at a Workshop in December 2010 and we started filming in May 2011. In October 2014 we finished the editing process and gave a first screening in November 2014. Then we had to do some little adjustments and had the premiere in July 2015. After that we started the DVD production and the DVDs manufacture was completed in September 2015. So, it took us all in all, about 5 years. But you have to know, we had our day jobs to do, beside this project. We worked nearly every weekend and spend all our vacations for two years to finish this film. Will the film be available to buy through your website? DDC: We think so. But we have to admit, we never thought about the possibility of selling the DVD of 'Beautiful Nothing' to anyone other than our friends. 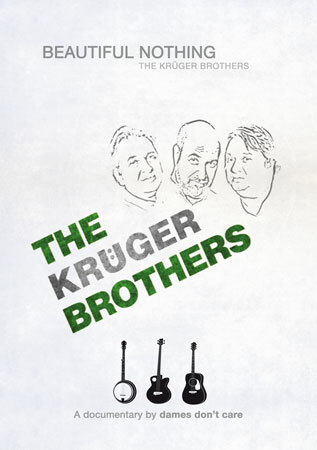 But after the first screening the Krugers came with the idea to sell DVDs at their concerts and on their website. And before we could think we are now sitting here with 1,000 DVDs. So yes, we will sell DVDs as will the Kruger Brothers. But we need some time to figure out how. But if someone would like to purchase a DVD, send us an e-mail and we will reply as soon as possible. DDC: First of all we want to promote the film. You know.. when we finished the film we had a screening in Switzerland for our friends and friends of the Krugers and we thought, 'that's it, finished'. But then so many people came up with new ideas where and how to screen the film and we thought, 'ok, let‘s do it right' and we contacted "Carolina in the Fall" with the idea to screen the film at the end of the festival as the U.S. premiere and there new friends came up with new ideas.. and here we are with hundreds of ideas. As we did the whole project of our own and with our own money, we have no producer, promoter or distributer to which we are accountable. But besides that, we feel like organizing some new events, as we did in the past. That's our other passion, events in the style of the era between the 20's and 50's. 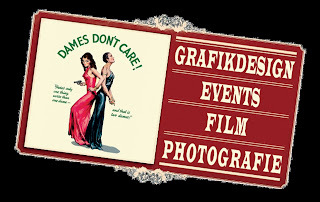 If you would like to buy a copy of 'Beautiful Nothing': A film about the Krüger Brothers then please contact Dames Don't Care via their website or e-mail. Finally, here is a recording of the Krüger Brothers playing 'Beautiful Nothing' which gave the fils it's name.